Hi, on our last day in Hong Kong were planning to go to Disneyland since our departure time will be 1:00 am. Is it possible to leave our luggage in the City Gate or in the Disneyland? were planning to go to Disneyland and City Gate on our last day and afterwards headed straight to the airport. Is there a bus or MTR in the City Gate or how to get to the airport the convenient and cheapest way. By the way, we are 3 adult and a child. It is good to hear some suggestions of itinerary on our last day, thank you so much. 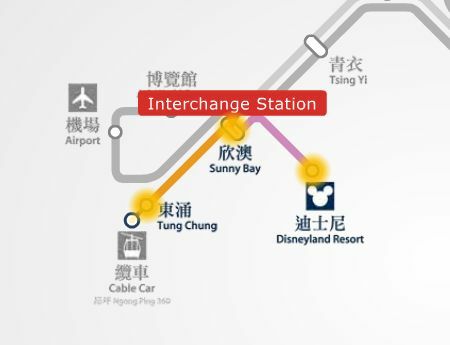 Hong Kong Disneyland, Citygate Outlets, and the Hong Kong International Airport (HKIA) are all located at Lantau Island and are close to each other. I would recommend that you'll go first to Hong Kong Disneyland then to Citygate Outlets as I assume that you will be buying thing at Citygate before heading to the airport. There are storage lockers for your luggage available for rental at Hong Kong Disneyland Park at the north end of Center Street, midway up Main Street, U.S.A.
Citygate Outlets can be reached to and from the airport in just around 10 minutes by buses S1, S52P and S64 but since you're in group with some luggage, I highly recommend that you will take a Taxi. Buses are only recommended for passengers bringing not too many luggage. Taking a taxi from Citygate Outlets to HKIA would only be less than 10 minutes and it cost only around HK$ 100 total for your group - highly recommended. Taking the MTR trains then Airport Express trains from Citygate Outlets, Tung Chung MTR station to HKIA, Airport station is 33 minutes - HK$ 60 / adult, HK$ 30 / child (HK$ 210 total to your group) - not recommended. Related topic discussion that I recommend for you to read, getting to Disneyland from HKIA and vice-versa. Hope this help and enjoy your stay in Hong Kong! Join in and write your own page! It's easy to do. How? Simply click here to return to Lantau island experience.